SHOP FOX W1669 1/2-Horsepower Benchtop Radial Drill Press is a handy drill press that can be a thoughtful addition to your shop. You can easily drill any necessary angle between the tilt head and the tilt of the table. Shop Fox W1669 radial drill press can also be used as a flat boring machine. It features a great swing that allows you to bore to the centre of a workpiece that is 34-inch wide. You can easily drill a wider workpiece up to 34 inches diameter, you can easily rotate the headstock in and out to maximize up to 17 inches space from the drill chuck to the column. It lets you tilt the headstock between 45° to 90° for drilling angled holes or for flat boring machine use. SHOP FOX W1669 drill press has an accurate ground cast iron table (adjustable tilt from 90° both left and right). 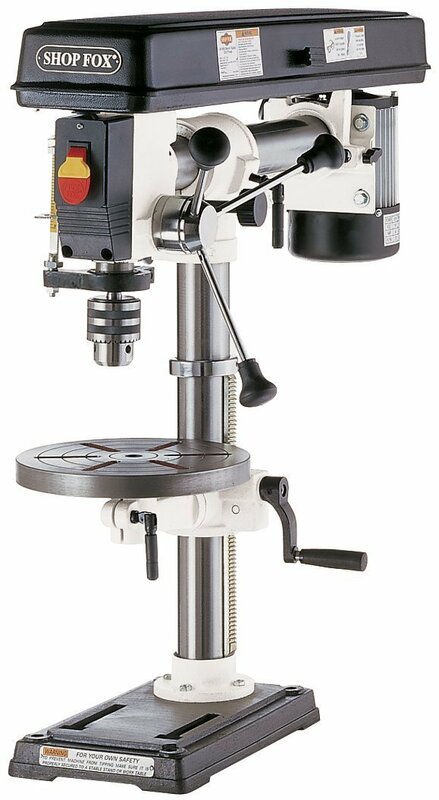 It lets you adjust the table for height and angle making so this is a multipurpose drill press for numerous applications. It also comes with a safety paddle switch that provides increased safety compared to other types of 110 volts on-off switches as it comes with large-size paddle and removable lock-out key.